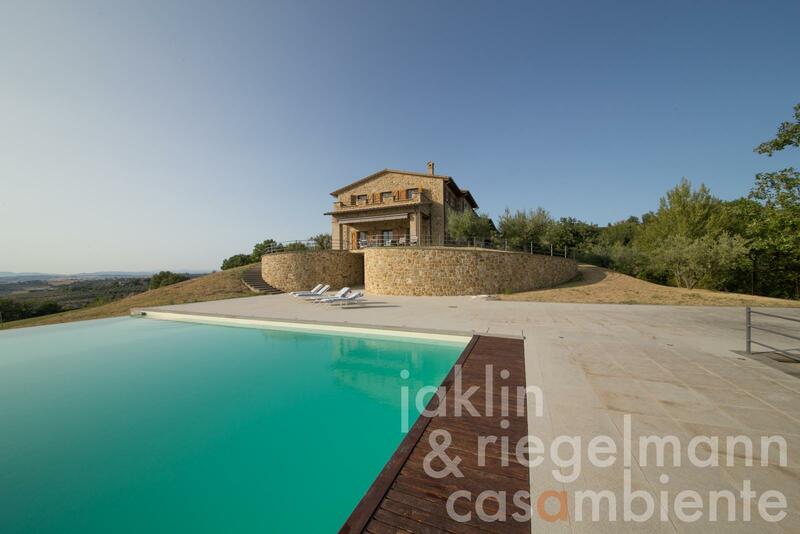 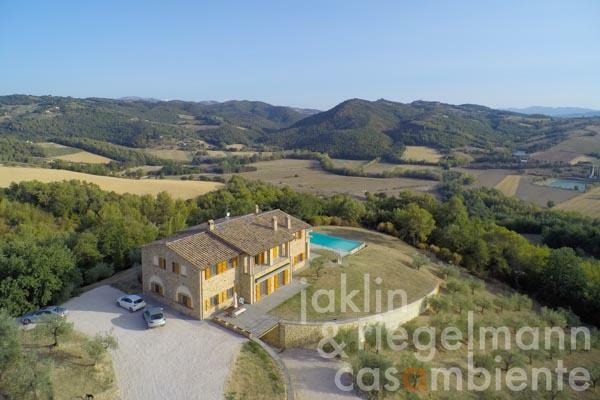 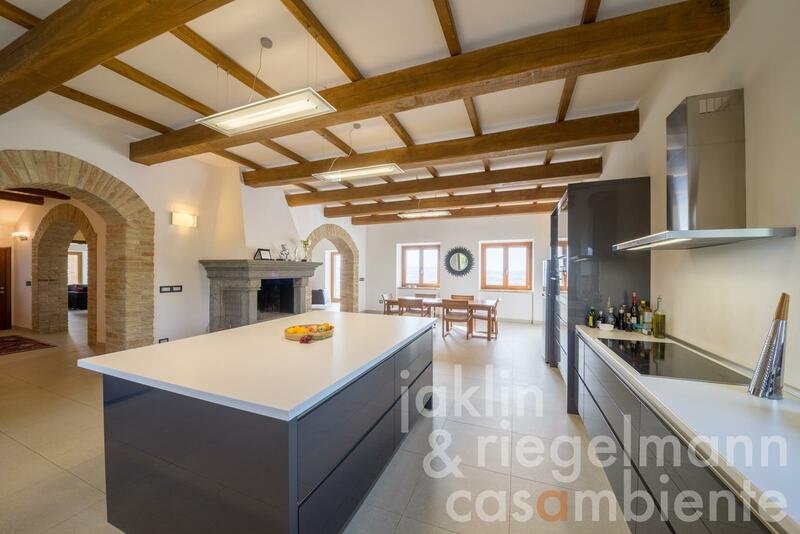 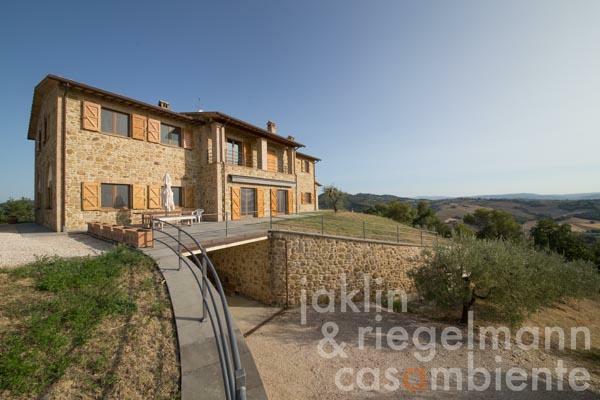 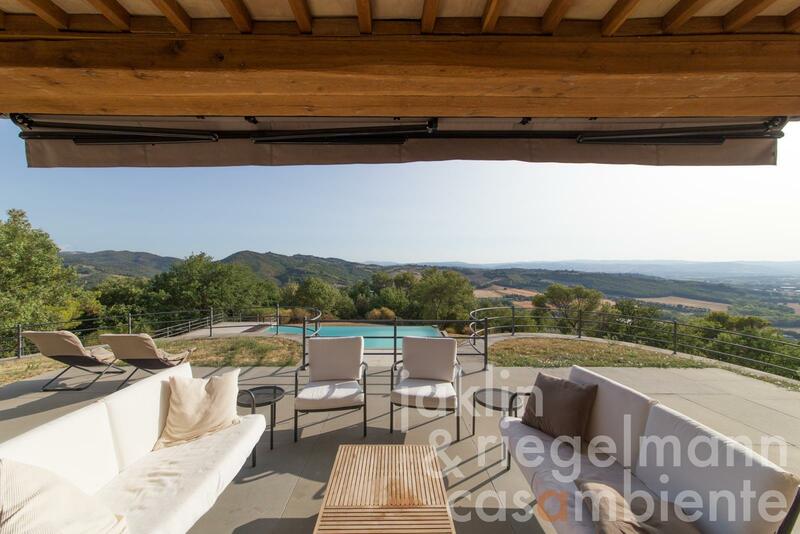 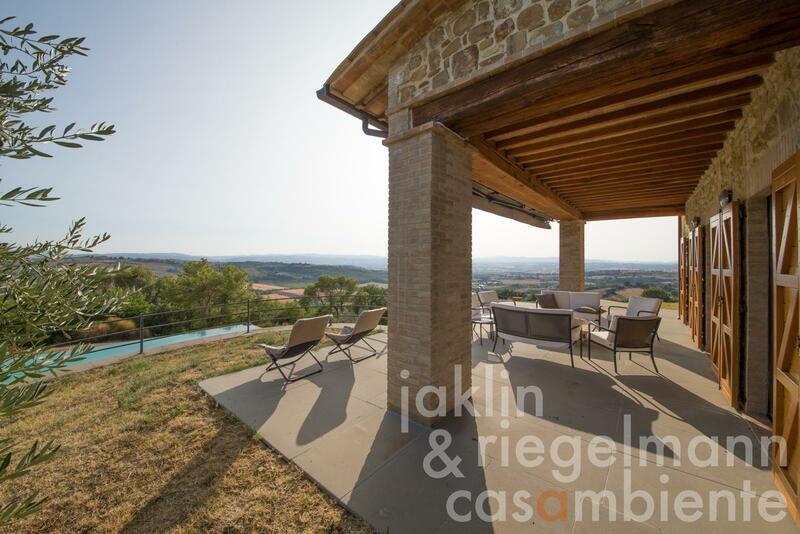 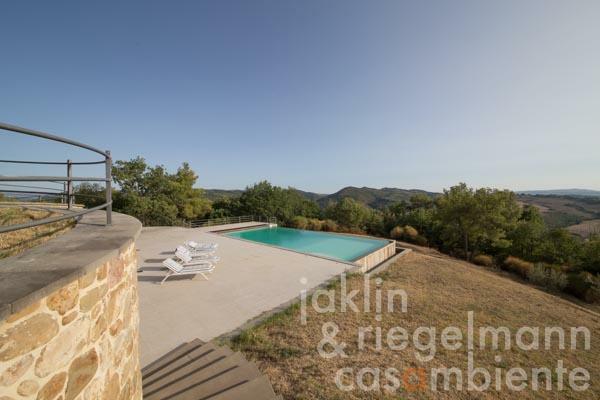 This beautifully situated property is located between Perugia and Todi in Umbria. 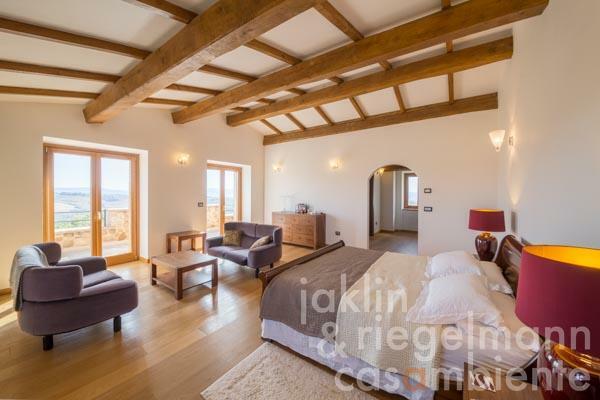 The stone villa was built a few years ago using the latest construction techniques and is clad in the natural stones of the original farmhouse. The property includes a 14 x 7 m Infinity-Pool and approx. 7.7 ha of land with a large olive grove, orchard and own vineyard. 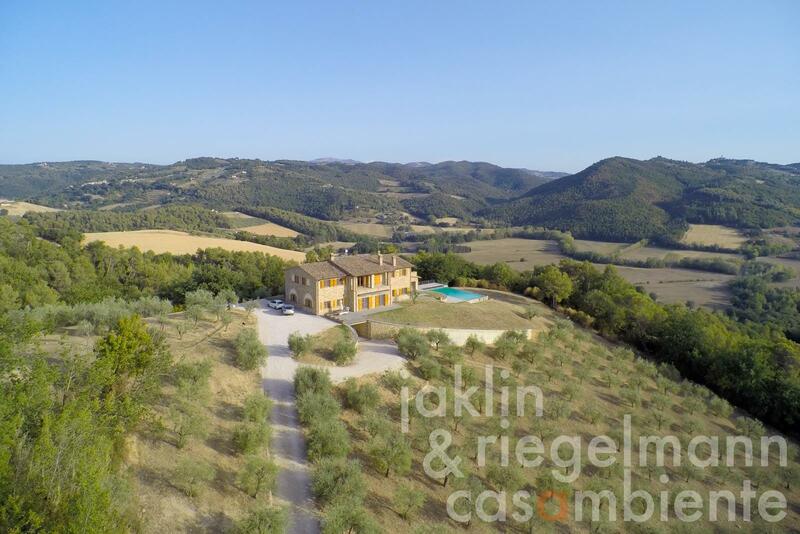 The 270° panoramic view over the Tiber Valley and the surrounding hills is breathtaking and turns day and season into a spectacle. 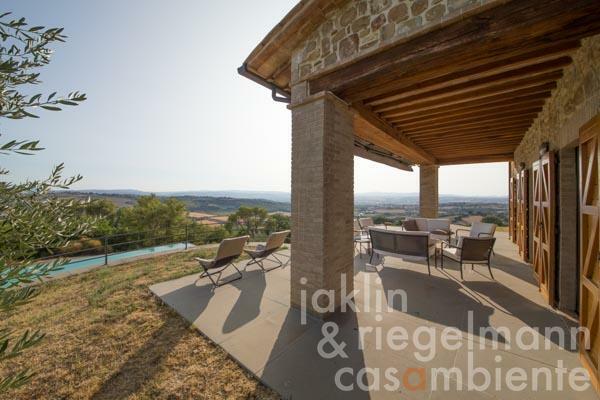 The house itself is in traditional Umbrian style, but offers larger windows and a more modern layout, high quality materials and state-of-the-art building technology. The villa has three levels with a total of 770 m² and large, bright rooms. 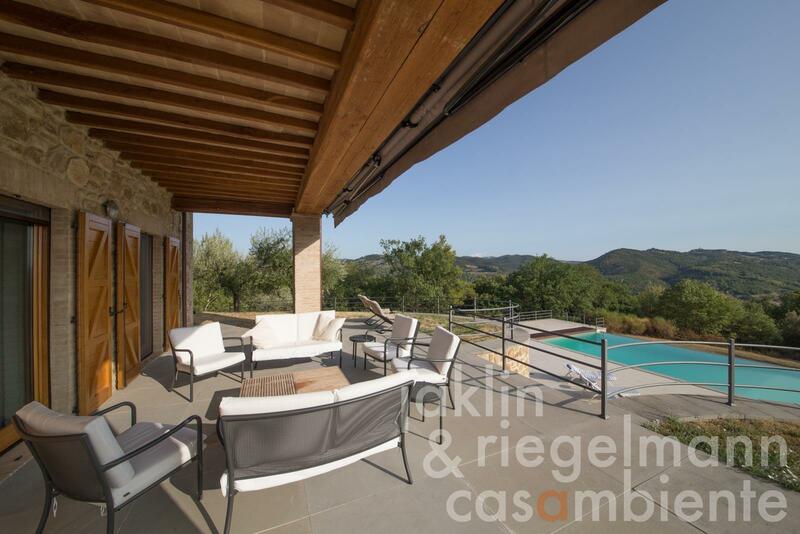 The terraces of Pietra Serena, directly adjacent to the house, are about 120 m² in size, plus the 100 m² terrace by the pool. About 4 hectares of the property consist of ancient forest, which encloses the property. 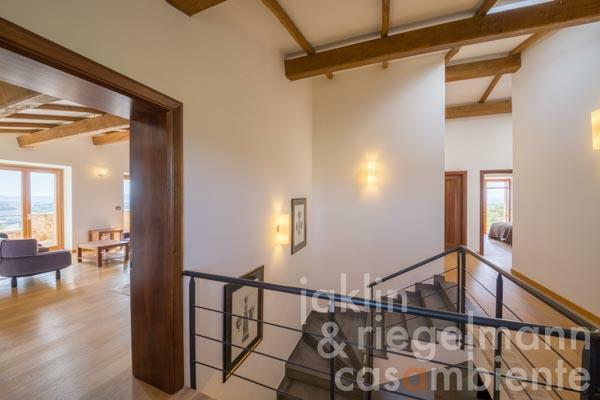 On the ground floor of the villa there is a large entrance hall with stairs leading up to the upper floor. 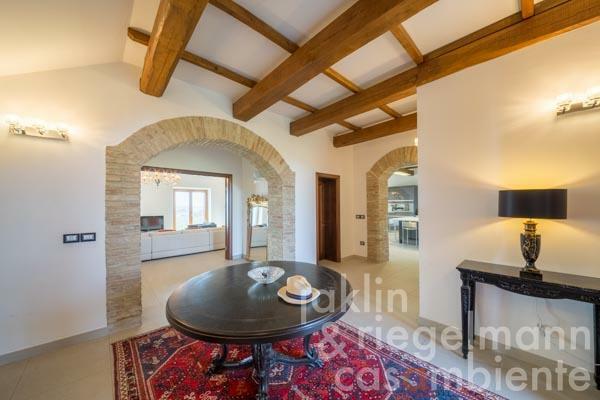 From the hall you enter a very spacious modern kitchen with a large stone fireplace and dining area. The main living room with fireplace and access to the garden is located directly adjacent. Another lounge with fireplace opens onto a covered terrace overlooking the pool and the surrounding hills. 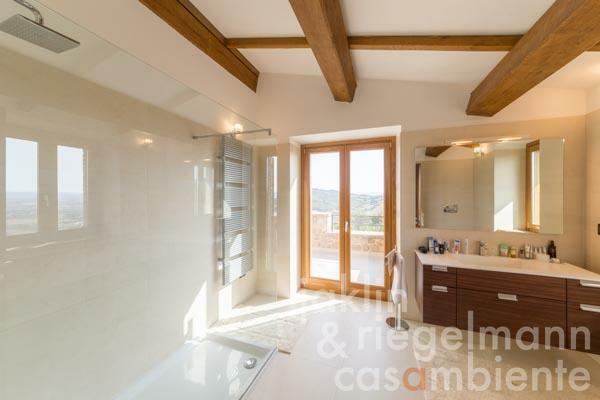 A study, which can also be used as a bedroom, a WC and a cloakroom complete this level. 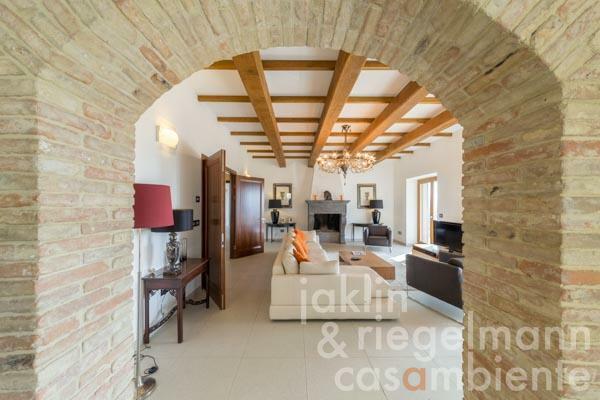 The spacious open rooms on the ground floor are connected by attractive arches of reclaimed brick. 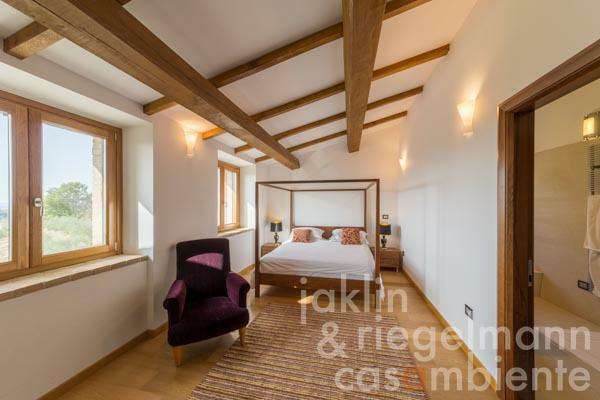 The upper floor consists of a very spacious master bedroom with panoramic terrace, en-suite bathroom and dressing room, two further double bedrooms each with en-suite bathroom as well as three further double bedrooms and a family bathroom. 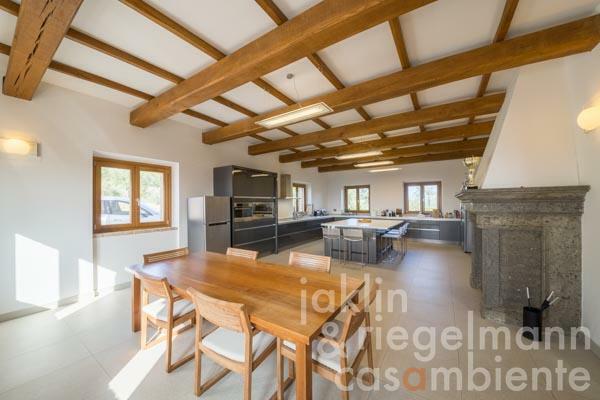 In the basement there is a large garage for four cars, two wine cellars with winemaking equipment, another large games room, a kitchen/household room, two storerooms and a very large bathroom that could include a large sauna. 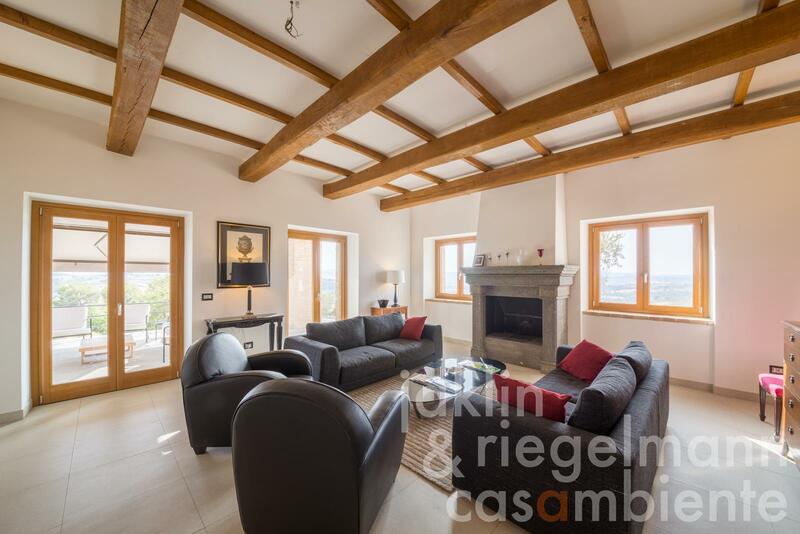 The property is characterised by extreme care in the choice of materials and details, which are essential for the high living comfort and environmental compatibility of this property. 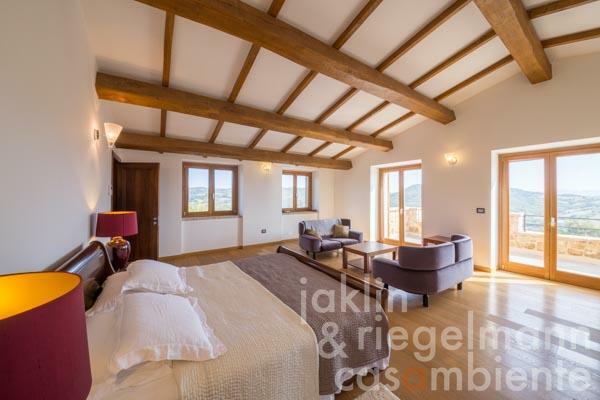 The house is completely encased from the outside, has partly triple walls, double glazed windows with UV filters, oak shutters outside and cherry wood doors inside. 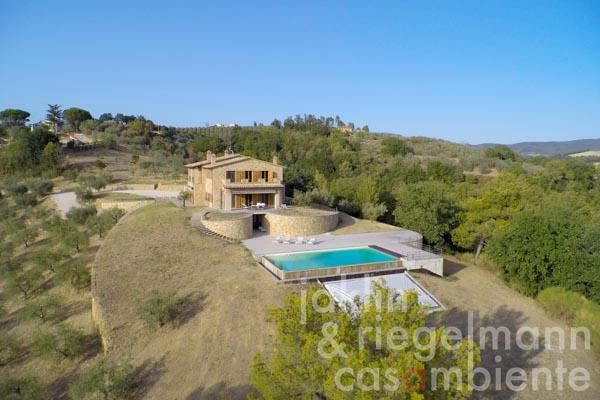 A ground source heat pump with 4 x 120 m wells, solar panels, underfloor heating throughout and a rainwater tank for water supply are further characteristics. 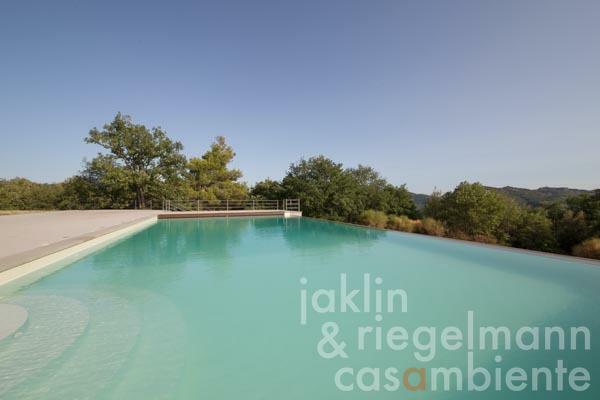 The rainwater is used for the pool and can also be used to irrigate the garden. 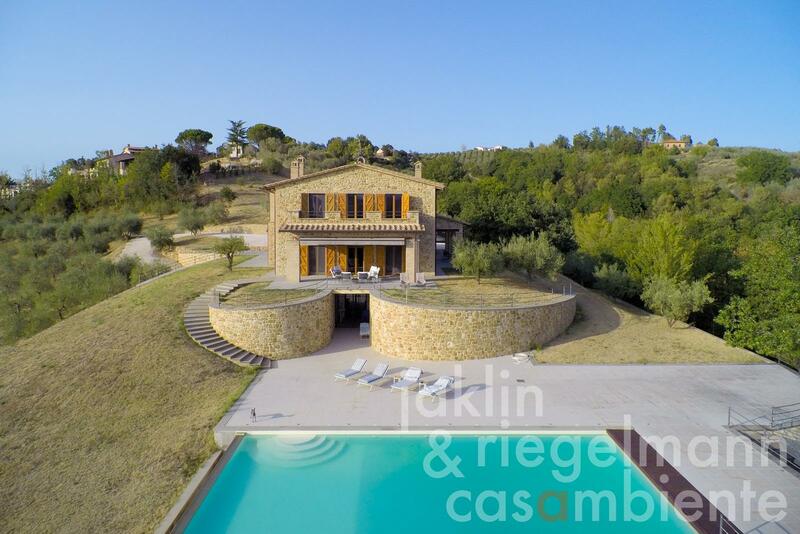 A very carefully and finely designed property in a wonderful location, from where you can reach the nearest places for all your daily errands in a few minutes by car (3-10 km). 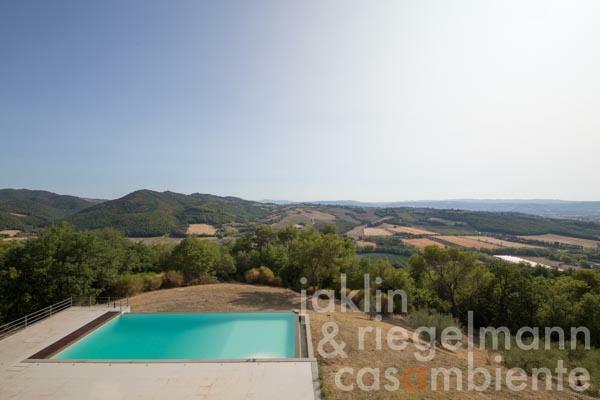 Todi and Montefalco are 20-25 km away, Perugia and Assisi 30-35 km, Spoleto and Lago Trasimeno 40 km, Orvieto 60 km, Adriatic coast 140 km, Rome 150 km, Florence 175 km. 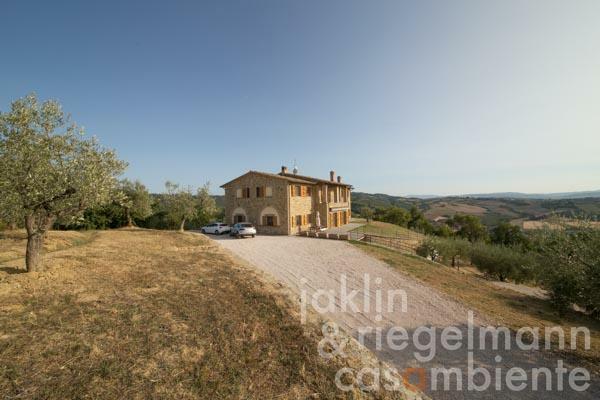 Distance from airports: Perugia 29 km, Ancona 135 km, Rome 181 km, Florence 194 km. 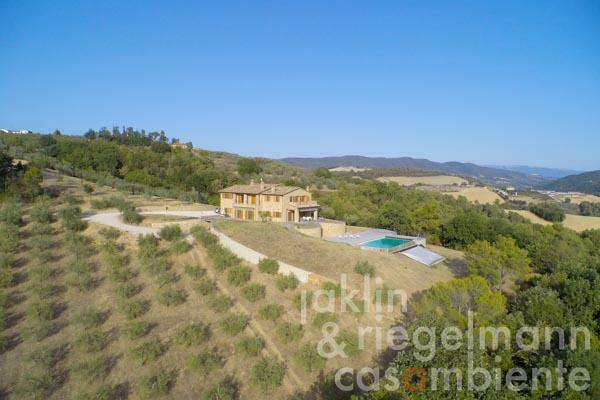 7.77 ha with olive grove and vineyard. 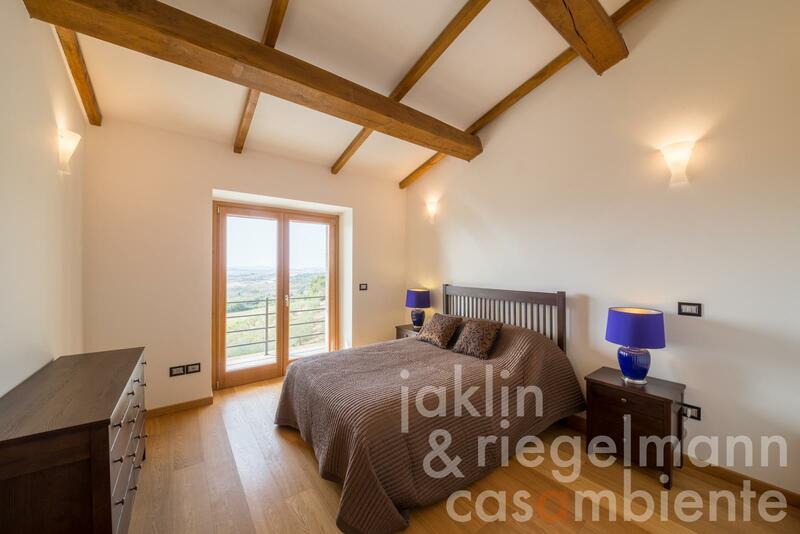 Electricity, mains water, rain water cistern, central heating, solar thermal system, underfloor heating, fireplace, broadband internet access, satellite-TV, automatic gate, irrigation system, swimming pool, garage, private parking, terrace, vineyard, olive grove, garden.